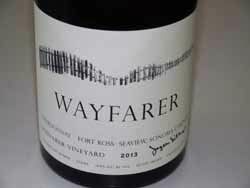 In October 2014, I led off the PinotFile with an article on the inaugural wines released from Wayfarer Vineyard located in the Fort Ross-Seaview AVA. I raved about the 2012 Wayfarer Pinot Noirs and Chardonnay then, and recently tasted the 2013 Wayfarer releases and I was captivated again. It is unprecedented for me to put a winery on the front page of the PinotFile twice within a year, but these wines are that good. The wines are expensive, but not unreasonably so given the challenges of farming on the edge and the extraordinary high quality of the wines. 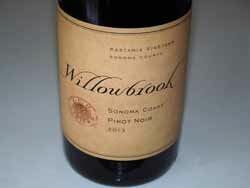 The Pinot Noirs in this vintage show slightly less extraction than in 2012 with more acidity. The wines are definitely picked on the ripe side. Oak is very well integrated. The differences among each of the bottlings is quite subtle but definitely present, and it is a privilege to taste them side by side which allows the nuances to be discovered. The inaugural 2012 Fathers & Daughters Cellars Ferrington Vineyard Anderson Valley Pinot Noir and 2013 Fathers & Daughters Cellars Ferrington Vineyard Anderson Valley Sauvignon Blanc were released on Father’s Day, June 21, 2015. Bay area builder Kurt Schoeneman and his daughter Sarah began a search in 1996 for appropriate land to grow wine grapes. The search ended in the discovery of Ferrington Vineyard, a parcel in the Anderson Valley just outside the town of Boonville that had been allowed to go fallow. The vineyard was first planted in 1969 by Balvern Vineyards who acquired the property when it was part of the much larger Rankin sheep ranch. Dr. Richard Ferrington bought the property in the 1980s and turned it over to the Schoenemans. Since acquiring Ferrington Vineyard the Schoenemans brought the vineyard into prominence, gathering a reputation for producing premium quality grapes used by many highly lauded wineries including Arista, Breggo Cellars, FEL, Flowers, Harmonique, Londer Vineyards, MacPhail, Schramsberg, Twomey,and Williams- Selyem. The Schoeneman family had never bottled a wine for sale under their own label until now. Fathers & Daughters Cellars is a multi-generational effort of the “fathers and daughters” in the family: patriarch Kurt Schoeneman, his daughter Sarah, Sarah’s husband Guy Pacurar, their daughter Ella, and Guy’s older daughter, Taylor. The family’s goal is to produce small quantities of ultra premium wine and create a legacy business that can be passed down through generations. 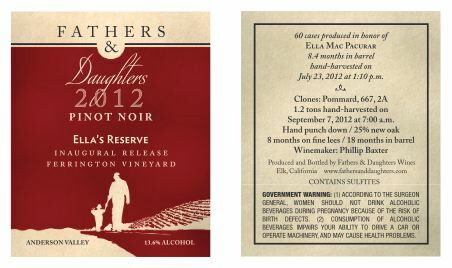 The harvest of the first vintage in 2012 coincided with the birth of Guy and Sarah’s daughter, Ella. At just 2 months of age and awake at 4:00 am, Ella joined her parents in the vineyard as they sorted the harvested Pinot Noir grapes. Reference to Ella Mac Pacurar is made on the back label. To mark this event, the family approached noted winemaker Phil Baxter of Baxter Wines to oversee the production of the wines for the new label. 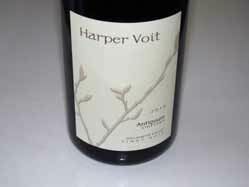 The wine was first poured at this year’s Anderson Valley Pinot Noir Festival and then at the Los Angeles Winefest. Guy Pacurar found that fathers and daughters were drawn to the table because of the name and the memories of their relationships that it triggered. The first two releases are available primarily through a mailing list that will be capped at 500 members, but may also be purchased by contacting the winery direct at 707-813-1137 or at pacurar.guy@gmail.com. 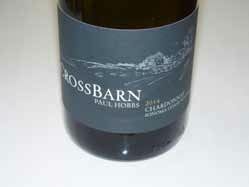 Subsequent releases will include a 2014 Chardonnay and a 2015 Gewürztraminer, also sourced from the Ferrington Vineyard. 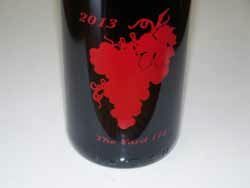 The website is www.FandDCellars.com. 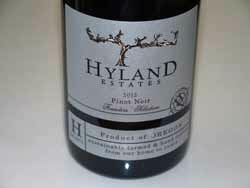 I am frequently asked to recommend a really good Pinot Noir under $30, the so-called sweet spot. Most consumers are not willing to pay over $30 for a wine they want to drink on a daily basis. 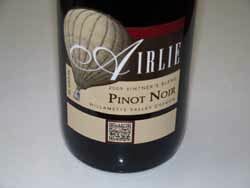 I was pleasantly surprised with my first tasting of Airlie Winery Pinot Noirs and I can highly recommend them for their high quality at surprisingly reasonable prices. The name of this winery is derived from the town name of Airlie that has a rich background dating back to the early 1800s. Once a Christmas tree farm, the original owners established and began planting Dunn Forest Vineyard in 1983 and founded Airlie Winery in 1986. Mary Olson bought Arlie Winery and the estate vineyard in 1997. Winemaker Elizabeth Clark joined the Airlie family in 2005. The winery is nestled in the coastal mountain range on the western edge of the Willamette Valley, just a short distance from Corvallis and Monmouth. Thirty acres of estate vineyards are planted to 8 varieties: Pinot Noir, Pinot Gris, Pinot Blanc, Chardonnay, Riesling, Müller-Thurgau, Gewürztraminer, Maréchal Foch and Muscat Ottonel and varietal wines are made from each. Estate grapes make up 65 percent of the grapes used in Airlie wines. 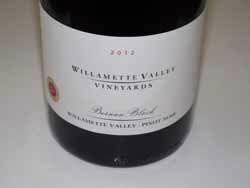 The remaining grapes are sourced from BeckenRidge Vineyard, located 20 miles away west of Dallas, Oregon. The vineyards are certified sustainable by LIVE and Salmon Safe. The Airlie wines are sold online through the website at www.airliewinery.com. 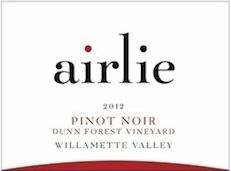 A new label will appear on the release of the 2012 Airlie Pinot Noir in the fall of 2015. All the wines reviewed below are still available from the winery. Gypsy Canyon founder and winemaker Deborah Hall honors the history of early California winemaking by her unique hand blown glass bottles and embossed glass seals that hark back to time of the Spanish Padres from Mexico who established a chain of California missions from 1767 to 1833 and planted Mission grapes along the way. Her ancient Mission grape vineyard of 3 acres was planted in 1887, and is part of only 10 acres still growing in California, and is the oldest producing vineyard in Santa Barbara County. 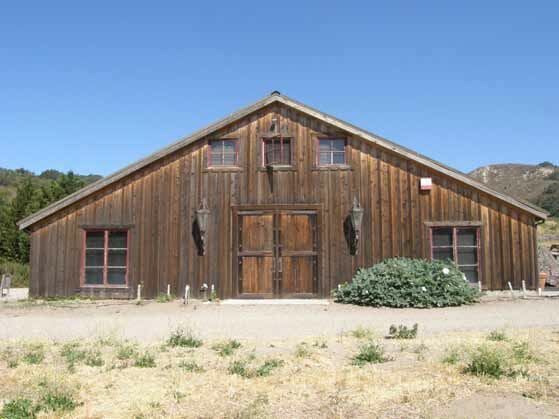 The original Gypsy Canyon property was acquired by Deborah and her spouse as a getaway from the rigors of practicing medicine (he was a physician and she was a nurse). Shortly thereafter, Deborah’s husband passed away and she sold 160 acres of the property, retaining 130 acres. 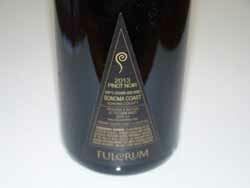 She planted 12 acres of vineyard in 1999 to Pinot Noir (Dijon clones 777 and 115) and Pinot Gris. The estate vineyard, which is located in an exceptionally cool microclimate in the Sta. 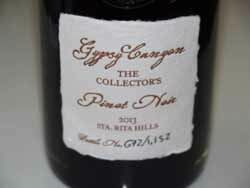 Rita Hills, was named Gypsy Canyon Santa Rita Creek Vineyard. The first harvest was 2003. Gypsy Canyon is a tiny, boutique winery, producing about 500 cases of Pinot Noir, Chardonnay and the Estate Ancient Vine Angelica. 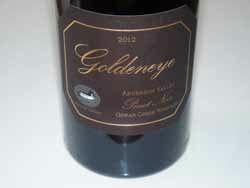 The 2013 releases include “The Collector’s” Pinot Noir made from estate vineyard fruit, and “The Moment” Pinot Noir that is a barrel selection from the vineyard. The 2012 “Ground Boots” Pinot Noir is made from sourced fruit with all profits going to Soi Dog, a charity which rescues and cares for thousands of dogs each year. The Ancient Vine Angelica is my favorite all-time dessert wine. The Ancient Vine Angelica is a fortified dessert wine made from Mission grapes planted in the Gypsy Canyon Dona Marcelina’s Vineyard, named after the first women winegrower in California, Dona Marcelina Felix Dominquez. Deborah crafts this unique wine using a recipe written in 1891 by Emile Vache that reflects the manner in which the Spanish padres produced Angelica for their own enjoyment. The Mission vines are extremely low yielding and a challenge to ripen, usually only allowing production of about one barrel each vintage. This is a highly unique, artisan wine that is offered in a historically correct, hand-blown 375 ml glass bottle with a seal on the neck, a handmade paper label printed on a manual letterpress and sealed with estate-harvested bees wax. It has no rival in California. 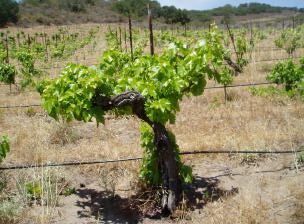 Photo of Mission vine, planted in 1880, by Dominquez at Gypsy Canyon below. Wines are allocated to members of the mailing list. Sign up at www.gypsycanyon.com. Carl John Kingston left Michigan in the early 1900s for Chile in search of gold and copper. He never struck gold, but did find a large cattle ranch 12 miles from the Pacific Ocean in the hills of Chile’s Casablanca Valley. A number of years later, Courtney Kingston, while attending graduate school at Stanford University, decided to plant a vineyard on the property and started in 1998. 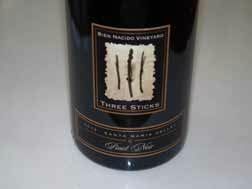 The Kingstons betted on Pinot Noir and Syrah in a valley that was known exclusively for white wines. In 2003, they produced 300 cases of Pinot Noir and Syrah under the Kingston Family label implicitly to show the potential of coastal Chile for these varietals. Today, Kingston Family Vineyards is recognized as one the best wineries in Chile and known for making some of Chile’s best Pinot Noirs. The winery has been one of the chosen participating wineries at the world-renown International Pinot Noir Celebration in McMinnville, Oregon, where I first met up with the wines. 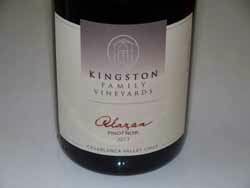 The Kingston Family Pinot Noirs are crafted by consulting American winemaker Byron Kosuge (Miura, McIntyre and B. Kosuge Wines in California) and Chilean winemaker Amael Orrego. The Pinot Noirs at Kingston Family receive a 5-day + cold soak, native fermentation in small open top fermenters and undergo malolactic fermentation in barrel using indigenous bacteria. The wines are aged in French oak barrels with new oak varying from 15% (Tobiano) to 30% (Alazan). 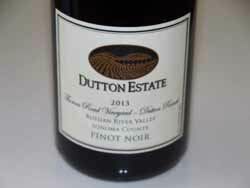 Kingston Family produced three Pinot Noirs in 2012 from 80 acres of different blocks and different lots that are barrel selected in the winery. Alazan is a product of the finest lots, while Tobiano is the next, more affordable tier. The planted clones are Dijon 777 and Kingston “Grande” and “Chico,” which are the winery’s own selections, as well as Valdivieso and Conco y Toro. 95% of the vines are own-rooted, planted in red clay loam with decomposed granite. 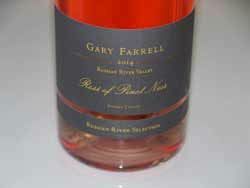 The wines are exported to the United States and worth seeking out. Visit the website at www.kingstonvineyards.com where the wines are also sold online. I received an unusually large number of wines to review recently, a number of which were extraordinary. I am going to get straight to the reviews, with little or no background verbiage. Balletto Vineyards This winery makes all of its wines from sustainably-farmed estate vineyards located in the southern third of the Russian River Valley. 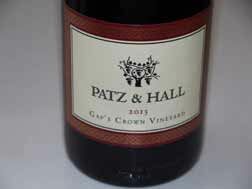 It is one of the few Russian River Valley wineries to be 100% estate grown and estate bottled. 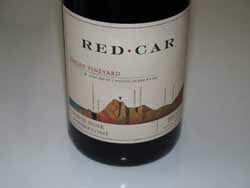 CARR An urban winery established by Ryan Carr in 1999 producing 4,500 cases annually in downtown Santa Barbara. The wines are consistently excellent and available for tasting at The Barrel Room in downtown Santa Barbara and The Warehouse in Santa Ynez. Fulcrum I found the vineyard designated wines hard to judge as the nose on all the wines was quite primary, even with extended air time and sampling a day after opening. I believe the wines in this vintage need more time in bottle, and I gave a range of scores as a result. Goldeneye Wines Goldeneye farms 200 acres over four estate vineyards with 96 unique blocks and 49 combinations of clone and rootstock. The estate vineyards span only 8 miles in the Anderson Valley, but all the wines are distinctly different. Goldeneye has a distinctive style. The wines are bold, even voluptuous expressions of Pinot Noir embellished by significant oak, but extremely well crafted in that style. Despite the fruit-driven character, the terroir of the individual vineyards does shine through in the wines. All the wines reviewed below are current releases. Red Car This winery focuses on growing Pinot Noir, Chardonnay and Syrah in the cold-climate regions on the edge of the Pacific Ocean in the West Sonoma Coast. A large of amount of fruit is grown by the winery. For several years, organic and biodynamic farming has been integrated into the vineyards. All wines are made in small lots with native yeast fermentation, gravity flow, and natural acid. Winemaker Carroll Kemp takes the tenants of the In Pursuit of Balance movement seriously. Rexford Winery Joe Miller, a long time Professor of Astronomy and Astrophysics at University of California at Santa Cruz, is the winemaker at this winery located on the west side of Santa Cruz. He has taught university courses on enology and wine appreciation for more than 30 years and began making wine in the 1970s. He has traveled extensively in the wine-producing regions of France, Italy and Australia. Joe works with his son Sam, the associate winemaker at Rexford. 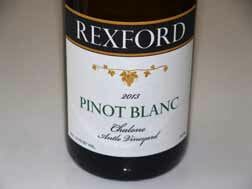 Visit the website for tasting room hours and to acquire the wines: www.rexfordwinery.com. 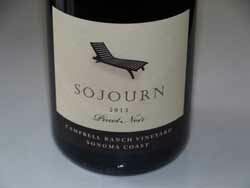 Sojourn Cellars Based in the town of Sonoma, Sojourn Cellars specializes in Pinot Noir, Chardonnay and Cabernet Sauvignon wines. Farming operations are directed at notable vineyards in Sonoma and Napa counties. Craig Haserot proprietor and Erich Bradley winemaker. This is a top producer with consistently fine offerings, although oak seems a bit heavy handed on some wines in this vintage. The Winery San Francisco This is a unique urban winery housed in a 20,000-square-foot World War II airplane hanger on San Francisco’s Treasure Island. The winery is dedicated to bringing the winery experience to wine enthusiasts in the Bay Area and has hosted nearly 100,000 people a year. The winemaker is Bryan Kane, also the winemaker for Sol Rouge, Howell Mountain Vineyards and Vie Winery. Thomas Fogarty Wine Estate Winemaker Nathan Kandler produces Pinot Noir and Chardonnay from 25 acres of Estate vineyards including 8 unique sites planted at high elevation in thin rocky soils. Yields in 2012 were at 2-tons-per-acre, the highest since 2009. All wines were fermented with indigenous yeast and naturally occurring malolactic fermentations. Total time in barrel was about 18 months. All wines were bottled unfined and unfiltered. These are somewhat earthy wines that have plenty of terroir-driven character, that are still young and chunky, and although the wines will likely benefit from a few more years in the cellar, it is hard to predict the future. 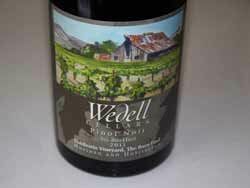 Wedell Cellars This winery was started in 1994 on the Central Coast of California, sourcing grapes from northern Santa Barbara and southern San Luis Obispo vineyards. The production facility is located in Santa Maria. Maurice and Susie Wedell are intimately involved in the production of the wines, assisted by consulting winemaker Kirby Anderson. The wines are typically aged an additional time in both barrel and bottle before release. 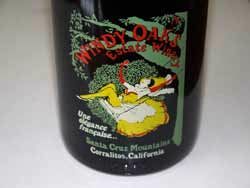 Windy Oaks Estate Winemaker Jim Schultze produces very limited amounts of a Pinot Noir from a half-acre section of the Schultze Family Vineyard that he hand tends himself. 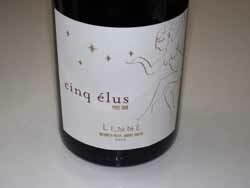 The clone is a rarely propagated French Burgundy Pinot Noir clone not available in the United States. The wines are typically aged over 2 years in 100% new French oak barrels. 14.3% alc., $75. Unfined and unfiltered. This wine was very favorably reviewed in December 2012, but this bottle either aged prematurely due to oxidation (doubtful since the long cork took a superhuman effort to extract) or has taken a rather rapid aging trajectory since 2012. · Light crimson in color in the glass. Aged nose profile with scents of cherry compote, cranberry, and hung game. Middleweight flavors of black cherry, dark raspberry and spice cake with some cherry-driven finishing intensity. Very soft in the mouth with heat showing up at the end. Completely shot the following day from a previously opened and re-corked bottle. Not scored. Soléna Estate Jackson Family Wine Estates bought the 35-acre Soléna Estate property and winery in Yamhill-Carlton AVA from Laurent Montalieu and Danielle Andrus Montalieu in 2013. The Montalieus retained their 20-acre Domaine Danielle Laurent Vineyard and the Soléna label and have a new facility that provides cellar storage for Soléna and Grand Cru Estates wines. 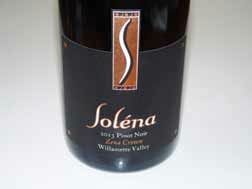 Soléna wine production is at Northwest Wine Company in Dundee. Willamette Valley Vineyards This winery was established in 1983 by winegrower and Oregon native, Jim Bernau. The winery has collaboratively grown its estate vineyards through partnerships with the merger with Bill Fuller of Tualatin Vineyards and the O’Briens of Elton Vineyard. This was the first “crowd funded” winery in the nation and has since grown to 5,000 shareholders. Dutton Estate Winery Dutton Ranch farms over 80 unique separate vineyards located in the coolest areas of the Russian River Valley, primarily in the appellation known as Green Valley. MacRostie Winery & Vineyards Steve MacRostie has been making highly praised Chardonnays since 1974 when he became the inaugural winemaker for Sonoma County’s Hacienda Winery. Today he works in partnership with winemaker Heidi Bridenhagen. 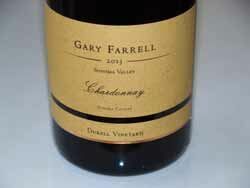 The Chardonnays are typically fermented with proprietary yeasts and bacteria, and aged in 20% new French oak barrels. 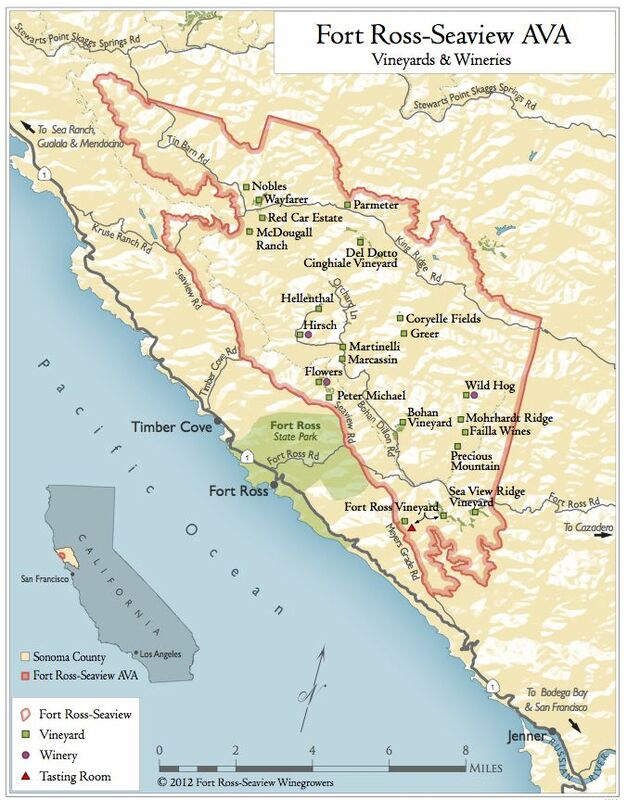 Sonoma Collection California is divided into 17 different grape growing districts. 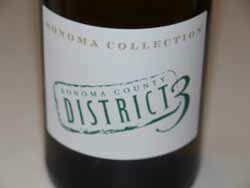 The Sonoma Collection highlights wines of District 3. The owners are Ned Hill, the owner of La Prenda Vineyards Management in Sonoma County and Matt Stornetta who is his operations manager. La Prenda manages 900 acres of land in Sonoma County. 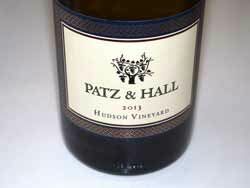 In 2013, Ned and Matt released their own wines from vineyards they manage. The bargain priced wines are called District 3. The consulting winemaker is Alex Beloz, previously at MacRostie Winery. Visit www.sonomawinegrowers.com. 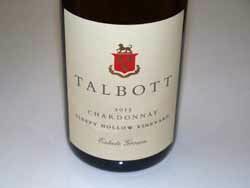 Talbott Vineyards Winemaker Dan Karlsen works with one of California’s iconic Chardonnay vineyards: Sleepy Hollow Vineyard, located in the Santa Lucia Highlands. In the past 7 years, 40% of the vineyard has been replanted with closer spacing, a switch to vertical shoot positioning, and the establishment of clonal material that works best on this site. All grapes are kept in-house. The different bottlings are defined by vine age, clone, block and other vineyard-driven factors. Other than small adjustments in aging time and amount of new oak, the wines are vinified in the same fashion so what you taste is what the vineyard provided. Soliste was my Winery of the Year in 2013 and those of you on the mailing list know how special these wines are. Co-proprietor and winemaker Claude Koberle is fanatical about quality. He knows that Pinot Noir requires total commitment. As he says, “You can’t cheat with Pinot Noir.” He feels that you met with great Pinot Noir when the wine is just getting better as you drain the bottle, and want a second bottle. Claude’s ultimate goal is to hold back his Pinot Noirs 3 to 4 years before release, acknowledging that the wines are not great until they have spent that time in bottle. Claude’s latest project is two rows of Swan selection rooted vines at Van der Kamp Vineyard on Sonoma Mountain which Claude reveres and considers a spiritual vineyard. Claude is also heavily involved in the restaurant industry, and recently opened a second restaurant in San Francisco named Octavia which is in the former Quince and Baker & Bankerspace. Chef Melissa Perello, who is heads the kitchen at Claude’s other San Francisco restaurant, Frances, serves market-driven food that changes daily. Octavia is 2 miles north of Frances. I recently dined with Claude at the Cannery Restaurant in Newport Beach where he poured his latest releases. My notes are brief as I enjoyed Claude’s banter, but the quality of the wines was unquestionable. The 2012 Soliste Sonoma Coast Solitaire (13.5%, 39 cases, $100) is a single barrel wine vinified in a large 600 liter barrel from a specific forest and tonnellerie, inspired by the vinification method used by Francois Bertheau in Chambolle Musigny. The wine has 50% whole cluster and is a single vineyard, single clone and single barrel Pinot Noir (MonoClone®) that undergoes extended barrel aging (28 months). Only 39 cases of 750 ml bottles and 144 magnums. This is truly a Grand Cru quality wine. The nose is exotic with profuse scents of red stone fruit, herbs, pepper, and sous-bois. Wonderful balance, with perfect integration of oak, and a silky palate of juicy fruit. Expect perfection in another 2 to 3 years. The 2012 Soliste St. Andelain Lake County Sauvignon Blanc (12.9% alc., 212 cases, $55) is a special wine.100% whole cluster, fermented in cigar-shaped barrel made famous by Didier Dagueneau and aged for 16 months. A stunning wine that offers aromas of grassy meadow and lime zest with a brilliant fruit core that lights up the palate with citrus, spice and nutty notes. 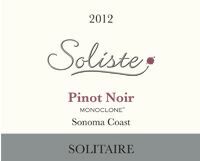 The 2014 Soliste Sonoma Coast Soleil Rouge Rosé de Pinot Noir (12.5%, $22) is the best rosé yet from Soliste. 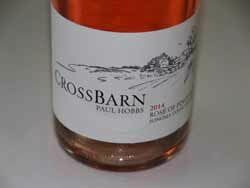 Lovely aromas and flavors of strawberry, grilled peach, melon and brown sugar. Less nervy, with better acid integration in this vintage. The 2012 Soliste L’Age D’Or Russian River Chardonnay (12.1%, $50). To be released November 2015. 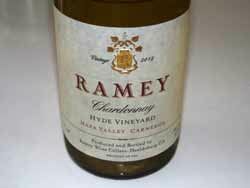 Made from the Rued clone of Chardonnay grown at Lynmar. Aged on the primary lees for 16 months. Still tight, but opens over time in the glass to reveal a sleek, round and citrus-infused wine that holds tremendous promise. 2011 Soliste L’Ambroise Sonoma Coast Pinot Noir (12.8% alc., 25 cases). “828” Arcus estate clone. This is a celestial wine with aromas of forest floor and raw beef, and a silky palate of bright cherry fruit with good backing tannins. 1970 Van der Kamp Sonoma Mountain Pinot Noir (clean skin). 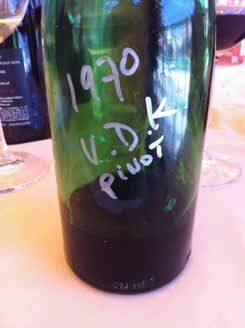 A bottle vinified by 85-year-old vineyard owner, Martin Van Der Kamp, and gifted to Claude. Martin's son, Ulysses, is primarily managing the vineyard on a daily vasis now. The wine was re-corked in 1980. Brownish red in color with a light yellow rim. Unbelievable enjoyment from a very silky wine with flavors of black cherry, pomegranate, fig and fruit leather. Soliste wines are sold by allocation to a mailing list. Visit the website at www.soliste.com. A special 2.0 dinner featuring Claude Koeberle of Soliste wines will be held at Playground Restaurant in Santa Ana, California, at the restaurant's 17-seat culinary theater, on August 13, 2015. For tickets, visit www.playgrounddtsa.com. West of West Wine Festival (WOW) This annual event is held July 31-August 2, 2015, in Sebastopol. Events include a West County Whole Hog Celebration Friday, July 31, Seminars and Lunch on Saturday, August 1, followed by a Gand Tasting of wines from the West Sonoma Coast provided by 40 winemakers and growers, followed by the Grand Dinner. Sunday, August 2, features a vineyard tour among the towering redwoods along Sonoma Coast’s renowned Taylor Lane, followed by a repeat of the Grand Tasting. All Access Passes are $595 per person, available at www.westsonomacoast.com. As an added event, Ted Lemon of Littorai will be hosting a wine dinner at Valette in Healdsburg on July 30, with farm-fresh ingredients paired with the 2013 Thieriot Vineyard Chardonnay and five 2012 Littorai Pinot Noirs ($150 per person, all inclusive; tickets at www.eventbrite.com). Bounty of Yamhill County A full weekend, Friday, August 28 to Sunday, August 30, 2015, to savor the flavor of Oregon wine country. This event was voted Best General Food Festival by USA Today. Welcome dinners with Owen Roe, Matzinger-Davies and Domino IV. Artisan farms tours and classes. Winery dinners at Adelsheim Vineyard, WillaKenzie Estate and Earth Winery. Grand Finale at Sokol Blosser Winery with the vintners, chefs and farmers of Yamhill County. For a complete description of all events and to buy tickets, visit www.bountyofyamhillcounty.com. Counter Culture: A Celebration of Urban Street Food & International Wine On the evening of July 23, 2015, Anne Amie Vineyards is hosting Counter Culture, a yearly event that precedes the International Pinot Noir Celebration. Food by Bollywood theater, Country Cat, DOC, Ember & Vine, Kuza Burger, Laurelhurst Market, Lovely’s Fifty-Fifty, Noraneka, Olympia Provisions, Party Downtown, Pok Pok, Per Que No, Smallwears, and Tastebud. Wine by Brooks Winery, Anne Amie Vineyards, Anthony Road Wine Company (New York), Apollini Vineyards, Authentique, SQ Wines, FEL Wines, Graham Beck Wines (South Africa), Gran Moraine, Hamilton-Russell Vineyards (South Africa), Langdon-Shiverick (France), Lincourt Vineyards, Sokol Blosser Winery, Precedent Wine, and Te Kairanga (New Zealand). Details and tickets at www.anneamie.com. 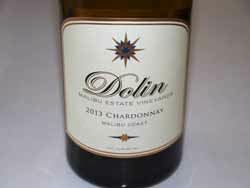 Meiomi Sold for $315 Million Joe Wagner, the son of Chuck Wagner of Caymus fame, sold Meiomi Pinot Noir and Chardonnay labels so he can buy more vineyards and develop other wine brands. The Meiomi brand has gained unprecedented popularity in a short time, becoming one of the top two restaurant Pinot Noirs by the glass in a matter of 7 years. Last year, the brand sold 550,000 cases and is on pace to sell more than 700,000 cases in 2015. Wagner will remain as consulting winemaker for Constellation for two years according to Shanken News Daily. Vendange Carmel Inn & Suites Wine-Themed Hotel This hotel has partnered with 14 Monterey County wineries to create a unique guest experience. Each winery sponsors one room or suite, providing its own creative touches. The McIntyre Vineyards room, for example, has a 100-year-old section of a grapevine. Participating wineries that produce Pinot Noir include Cima Collina, Holman Ranch, J. Lohr, Manzoni, McIntyre, Tudor and Ventana. Special new packages are now available through July 30. Visit www.vendengecarmel.com. Winemaker Film ‘Kusuda’ This is a 3-minute documentary about notable Japanese winemaker, Hiroyuki ‘Hiro’ Kusuda, who lives and works in Martingborough, New Zealand. Kusuda follows Hiro during a particularly challenging harvest, when Cyclone Pam threatens the loss of his entire crop. Hiro reflects on the uncontrollable forces of nature, his winemaking process, and the fragility of life itself. The filmmakers continue to film Hiro in hopes of developing a full length feature. View the film at www.loadingdocs.net/kusuda, or by embeddable link at https://vimeo.com/132291524. ‘Heroic Viticulture’ Film Nicolas Sakat has made a documentary while pursuing a bachelor of cinematography at the Beijing Film Academy. The subject is mountain viticulture from Valais, a viticole area in the south of Switzerland. His work has just been uploaded online. The film takes the viewer through the vineyards of Valais. Highly enjoyable! Webpage of the project (in French) is www.sakatland.com/web/?p=558. Full documentary on YouTube with English, French and Chinese subtitles) at https://www.youtube/.com/watch? v=Vlbtl-gfFng. 2000 Clos d’Ambonnay Released This expression of a single walled plot of vines, a single grape variety (Pinot Noir) and a single year has been released. Krug Clos d’Ambonnay is made from grapes farmed in a tiny walled .68-hectare plot in the heart of Ambonnay, one of the most distinguished villages in Champagne. This is a powerhouse, very expensive Champagne only released in special years (1996, 1998 and 2000). Only 5,158 bottles released. Joseph Jewell Wines Opens Tasting Room Winemakers Micah Joseph Wirth and Adrian Jewell Manspeaker announced the recent grand opening of the Joseph Jewell Wines Tasting Room in Forestville. Vineyard and winery tours are planned for the future. For more information, visit www.josephjewell.com. Youngberg Hill Winery & Inn Celebrating 25 Years Youngberg Hill is celebrating 25 years of history with a dinner prepared by an internationally acclaimed chef from Burgundy, Katherine Frelon. The dinner will feature local, seasonal ingredients paired with a library of Youngberg Hill wines. The date is Wednesday, July 22 at Youngberg Hill (2 days before the start of IPNC). 50 seats are available at $125 per person including gratuity. For reservations, visit wine@youngberghill.com. Coquard Wine Presses at Laetitia Winery and Vineyard The two wooden, 30-year-old, Coquard wine presses are the only such presses in North American, dating backing to the winery’s origins as Maison Deutz, a California estate established by France’s Champagne Deutz. In the late 1990s, Laetitia experimented with modern membrane presses, but found the juice coming from the Coquard presses was cleaner and more gently pressed, minimizing residual harshness from stems, skins and seeds. Despite the labor-intensive nature of the Coquard presses, the winery decided that all sparkling wine would be pressed only in the Coquards. In fact, the winery got permission from the Coquard Company to make a signature estate sparkling wine called Laetitia Brut Coquard. The 2010 vintage is currently available.